There’s nothing that says warm and cozy more than a roaring fire and a bowl of hot soup. Recently, we’ve had quite a few opportunities for that, haven’t we? I’ve taken advantage of these snuggly days by maximizing on a few comfort foods. The irony is that when I loaded these photos, it was 15 degrees, and now as I am typing – it’s 80 outside, but supposed to get back to 30. How did that happen in 4 days? Now, I am not going to post the recipes for the soup. You can probably find 1,000’s in those dusty cookbooks that line your cabinet, but I want to feature a good ‘ole fashioned favorite that has gone by the wayside. Yep, the dumpling. THEY ARE SO AMAZING!! He had no clue the treat he was about to partake, nor did I remember just how simple they were to whip together. Not to mention my favorite – inexpensive…pennies, people. It had been awhile since I made these, but I guarantee, these will now be a staple in our home. SERIOUSLY, it took 3 minutes to mix up the dough, and voila, I felt like I was Rachel Ray. That’ it…that’s all the ingredients, and you have them in your house right now! Sift dry ingredients (* if you want). Combine milk and oil; add to dry ingredients, stirring just till moistened. Drop from tablespoon atop bubbling stew. Reduce heat (don’t lift cover); simmer 12-15 minutes or till done. (*as soon as my kids saw them expand, they wanted to try them. We probably only waited five minutes for the smaller ones to finish.) Makes 5 servings. We did tiny ones, ginormous ones, and everything in between. In fact, I had to mix up additional dough because the kids were eating all the dumplings out of the stew, and there weren’t any left for the hubby. No time to make homemade soup? Make it home made your way, and use a few cans of chicken noodle soup, bring to a boil and just drop some of these in. 2 cups Bisquick mix 2/3 cup milk Stir ingredients until soft dough forms. Another quick and easy option is to use the Free or nearly free Cornbread mixes that “we” get when they’re on sale, and our coupons are doubled. You’d use that mix in place of the Bisquick mix. I doubled this and saved some for the next day. Soups are always better the following day since it gives the spices time to blend. Soups are another wonderful freezer meal. Just pour the extra in Ziplock bags to maximize your freezer space. Just FYI, my son can’t believe I am posting this picture. He pointed out that it looks like soup they might serve at an orphanage. You know the kind where they don’t have enough money, but want to feed a crowd? YUMMM! That creamy corn chowder looks so yummy too, will you share that recipe with us as well??? I guess I am the orphanage kind of gal! tehee! Oh my. The corn chowder sounds so good! Dumplings sound so good I haven’t had them in a long time and the corn chowder looks delicious! I love dumplings – but I've never thought of adding them to soup (other than chicken & dumplings). Now we have something new to try. And that creamy corn chowder sounds delicious! omg those look soo yummy…..i may have to try those out!! my mom used to make those dumplings and I loved them. Now I can make them myself. I had forgotten all about how yummy they were! Just YUM!!! Our favorites our chicken and dumplings, chicken noodle, and chicken tortilla! You just can’t beat homemade soups. Dumplings are indeed the very soul of comfort!! Yum! I love dumplings but I have never made them myself. It doesn’t seem to hard! The corn chowder looks great too! YUM! This looks amazing. Can’t wait to try it. if i’m in a big hurry, i do the cans of chicken soup, plus a can of chicken broth, bring to a boil, and then open a can of “pop out of the can” biscuits, cut each in half, dip each half in a beaten egg to cover the biscuit and then drop those into the boiling soup mix. boil uncovered about 10 minutes and then covered for 10 more minutes. the biscuits turn into perfect dumplings! so easy too! Oh…I have never made dumplings but they look so good. I think it looks wonderful! I only ever think to make dumplings the traditional 'chicken & dumpling' way. Cornbread dumplings in a corn chowder sounds delicious! Too funny about the soup feeding an orphanage! It looks super yummy!!! I’ve never made dumplings – too intimidating. Maybe I’ll try them now… Thanks for the inspiration! 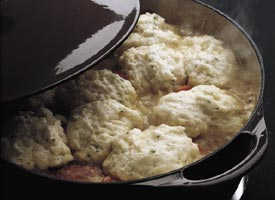 One of my all time favorites when I was a child was my Dad's Chicken & Dumplings. They were so yummy! I think the soup looks great! I’m sad to say that I have never made dumplings, but I remember my Mom making them when I was little. I’ll have to try them! Also, I love soup, no matter what the temperature! Umm…. just saw the hutch post. I hate you. I hate your hutch. I hate that I live in AZ and can only find furniture from Mexico and Target. I’d have to craft something out of a Saguaro cactus to be original. UGGG…. That was MY hutch. I’m convinced! Sister hand it over…. sigh.. working on that coveting thing. I’m In AWE! You NC girls don’t realize how good you got it back in furniture grand central. Yard sales here ain’t nothing on yard sales back east. Our history dates back to the Gold Rush and the Mexican War. Oh… I’m such a whiner! Sorry Jen… Can’t wait to see the finished product! Hubby would have wrestled any paint out of my hand for that beauty… “Lover of Wood: Protector of the Natural Grain.” It’s best she’s with you. Thanks for the reminder as to how easy these are – I’ll be making these for sure! Thanks for the recipes. I made my firt from scratch chicken soup last week that turned out really well and was thinking that it would have been nice to do it as Chicken and Dumplings on one of the ‘leftover’ days. I’ll have to try yours. My husband makes this from time to time . Some recipes are just beyond value !! Thank you for sharing. I have an award for you on my blog. Come on over and check it out. It doesn’t look bad at all! And we all know it’s how it tastes that matters and especially that it was prepared with love. That makes all the difference! Your son’s comment reminded me of the movie Nacho Libre with Jack Black. Hopefully, I’m not the only one who’s seen it! I second and third the desire for you to post your corn chowder recipe! Dumplings always scared me, but you make them look so easy! Hi I am visiting via T.I.R. What a great post. I love dumplings. I hope you will stop by for a visit as I am currently hosting a giveaway. Yummo, this looks so delish and a cold wet day like today! You must live in the same zone I do, first 30 then 80 now 40, crazy weather! I love dumplings and the corn chowder recipe sounds wonderful. Perhaps I can sneak it in before it heats up again. Thanks for sharing. I have my bowl and spoon ready. I love Chicken and Dumplings. Yummy!